Eighties nostalgia is rampant in the cinema right now, with my generation's favorite toys, games and TV shows getting repackaged for a new era; Battleship, Transformers, Teenage Mutant Ninja Turtles, The A Team, have all either already appeared on the big screen or soon will. But while those properties have built-in storylines—or in the case of Battleship, the malleability to have one tacked onto it—that are easily translated/re-imagined for new audiences, the Choose Your Own Adventure series of books—whereby readers must decide between multiple plot paths and story outcomes throughout the 'narrative'-—do not. And yet, SlashFilm reports that Fox has acquired the rights to the CYOA series with the intent of, ahem, adapting the books into films. How do you make a Choose Your Own Adventure movie? The very structure of a film is counter to the idea of the books. And so Fox wants “a cross-platform four-quadrant action adventure franchise,” reports THR [The Hollywood Reporter]. Cross-platform, naturally, because the property lends itself to gaming and other non-linear media. That’s where it really belongs. The thing to take away from this is that there will potentially be a bunch of media properties bearing the Choose Your Own Adventure brand, but precisely what will be created is as yet unknown. Chances are we’ll see a big-budget family-friendly movie to act as sales pitch for the whole shebang. Well, I mean...That kind of clears it up. I guess. Maybe I'm too linear in my thinking, but I still can't see how a movie could possibly fit into this scheme, unless it were more of a multimedia eBook, where the press of a button can show you numerous different narratives composed of alternate scenes...Actually, that sounds kinda cool. I agree it doesn't make a lot of sense to turn these into films in that you obviously lose the very thing that is great about them. HOWEVER, I will say that the end of CLUE is kinda fantastic, and if they find a way to do something like that, at the end, or throughout, they might actually have something worthwhile. Seems unlikely though! I'd love to see the introduction of a character, or several, who read the books and immerse themselves in the narrative (sort of like The Never Ending Story) where they are in the action and are making the decisions. They would then be a recurring character in the series of movies, and could also have a metanarrative outside each book that develops as the character reads each book. The series would be te story within the story, and the reader's story would form the framework of the series itself. This sounds like a job for David Fincher. Didn't they do this with the DVD release of one the FINAL DESTINATION flicks? I seem to remember it being horribly done though. 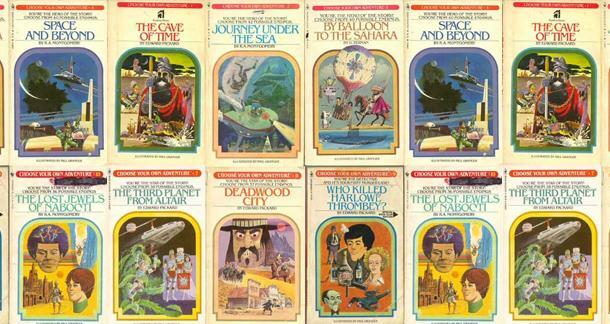 I loved this genre of books growing up. The LONE WOLF and WAY OF THE TIGER series especially, later on getting into the FIGHTING FANTASY books from the UK. I think there is definitely a lot of room to explore with the structural narration of film. It sounds good, would inevitably turn out crap, but still. I like the idea of watching a movie in a certain sequence and certain length, knowing that it could have left me with a totally different impression if the same pieces were in a different order or skipped certain scenes and added others. Renfield, they did do that. You could choose whether the character gets on the rollercoaster or doesn't. Usually you ended up dying either way. It was really stupid. I used to love the Goosebumps versions of these books, but I always chose the worst option! Guess we'll see how they manage this one. Doesn't seem logical to me. It's an amusing thought that they might pause a film in a cinema for the audience to push a button and choose where it goes next. You'd have to have a cinema equiped for that, for one thing. For another, the audience would never agree. How many people would walk out of something like that if they didn't get what they voted for? I probably would, as I'd be watching someone else's adventure rather than the one I chose. I used to cheat with those kinds of books when I had them anyway - I'd try all the options until I got the one I liked. I remember one book where I ended up becoming a swamp monster in the Florida everglades and thinking that was cooler than the version where a lab turned me back into a human. I remember long ago there was this gimmicky movie that got a limited run that let the audience vote on what actions the protagonist took. Maybe it will be like that, but probably not. Seems unlikely unless they're getting limited runs.